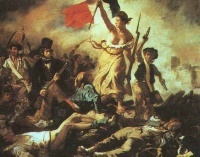 "Liberty Leading the People" is a romanticized depiction of the French Revolutionary ideal of liberty. Shared national ideals are the basis of the national value system. There are three national values in Victoria 2: Liberty, Order, and Equality. The Liberty national value represents a common national interest in the propagation and defense of human liberty. A liberty-focused nation is often filled with intensely independent people who do not easily bow to their government's demands—or to foreign invaders. Liberty also produces a robust economy that will not buckle under the weight of war. Liberty sets the country's base mobilization rate at 2% and the base mobilization impact at 75%. This makes liberty the weakest value early on, as most countries will not be able to mobilize any significant force at 2%. As the game progresses, techs allow an increased mobilization pool, and the player's economy becomes larger and more important. Liberty is an excellent National Value for countries that desire expansion through immigration. Pops' increased tendencies towards Liberal government types increase the likelihood that their governments will pass many of the Political reforms necessary for maximum immigrant attractiveness. The reduced economic impact of mobilization makes Liberty militarily the strongest value to have middle-to-late game, as techs make up for the low mobilization rate and the reduced impact of mobilization makes mobilizing less economically painful. The Order national value represents a common national interest in an orderly, law-abiding society. Order-based societies value tradition, law, and hierarchy above all else. A nation that values order is usually filled with people that will fulfill their duty if called upon, but are less diverse and economically competent. This value sets the country's base mobilization rate at 4% and the base mobilization impact at 100%. It is the most common national value and the middle of the road option so far as effects are concerned. The Equality national value represents a common national interest in an equal society. The definition and extent of this equality may be different from place to place, but the idea that the nation is one of equals, each with common stake in its survival, is a powerful one. These populations can be readily shaped into large conscript armies, but their economic prowess and organization is dulled by their zealous focus on equality over efficiency. This value sets the country's base mobilization rate at 6% and the base mobilization impact at 125%. Undoubtedly the most powerful value early game, when the armies of the world are small and easily overpowered by a large mobilization, and the economic impact is minimal. Late game it losses some of its luster, as technology and the growth of industry make the other values more attractive by comparison. Data on ideologies can be accessed by locating the Paradox folder in the drive to which it is saved, then navigating to Victoria 2/common/nationalvalues.txt. This page was last edited on 8 July 2018, at 16:59.